Today I did galdr with Wunjo. As before, I smoked Großmutter Una to cleanse and prepare myself. As before, I did the prayers to prepare and flowed into a good, clean whole self when I did. However, today was spent entirely in the garage doing the work. Breathing during the first round of galdr was different. There’s a different scent to the air inside the garage versus outside of it. Not bad, but inside there’s definitely more of a homely feel to the air and less of a wilder scent. All the various pieces of metal on the shelves, the tractor and the rototiller give off their own little scents too, so the whole feel of the garage is more home, more human. The first round of galdr brought with it different images. The first round my voice was very bass, and the garage seemed to echo out like I was on a plain. 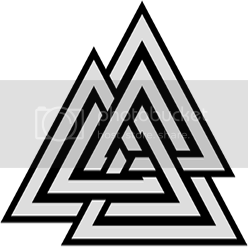 The first galdr of the first round brought with it an image of the Rune in white against a black background. The image then began to flutter, taking on shape, like a flag or pennant. Like the mast of a ship. The second galdr of the first round saw that flag in someone’s hand across a battlefield, yells. A cacophony of noise. The third galdr of the first round saw it run up over a fort on a long stick, then a flag run over a castle, and raised over a battlefield. The second round of galdr my voice was far lighter than the first. As I galdred the first thing I experienced was a family in their home, a warm fire lit, and sitting around a table talking, drinking, enjoying themselves. There was laughter, I remember that very clearly. The next galdr and the family was sitting around the fire and sharing something, I think dessert of some kind, and there was a person talking. There were guests, and they were smiling, listening to the speaker. The third galdr, and it was quite high and I had the sensation of the Gods being there, the images shifting to a person before an altar with their family, and thanks being given. I had the sensation of the Gods being happy, that happiness radiating all around. It was like…wrapped in warmth and joy. The third round of galdr my voice came rough, croaking. In the first galdr, Wunjo swung before me, an axe or a mace in the field of white on black. It was wielded by a hand covered in blood. The next galdr Wunjo was a hammer and it was nailing in a nail to the wall, repairing it. The last galdr was a chant, alternating between long and short galdr of Wunjo. I felt happiness, I felt surety of purpose. That idea of measure twice and cut once, of the family being united and good, of the Gods being pleased. That striving, and the fierce joy of having done well by it. As before, I made prayers of thanks to Rúnatýr and the Runevaettir. As before, I cleansed and then cleaned my pipe to come back to normal headspace.